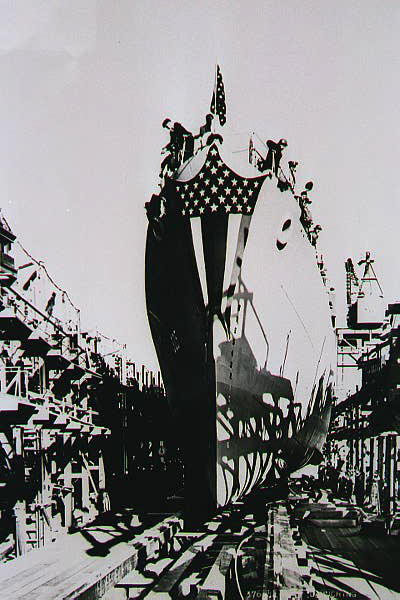 21 June 1943: Keel laid by the Mare Island Navy Yard, Vallejo, Cal. 42k William Ignatius Halloran was born on 23 July 1915 to Mr. & Mrs. Lawrence J. Halloran in Cleveland, Ohio. He attended John Carroll University from 1934 to 1936 followed by two more years at Ohio State University College of Arts and Sciences graduating in 1938 with a Bachelor of Science degree in Journalism. Prior to enlisting in the Navy he worked as a News Writer for United Press in Columbus and was the first American Newspaperman killed in action in World War II. He enlisted in the Naval Reserve as an apprentice seaman 14 August 1940 receiving active duty training aboard the USS Arkansas. He was commissioned Ensign on 12 June 1941 having completed his training at the Naval Reserve Midshipmen’s School (Abbott Hall), Northwestern University, Chicago, Illinois. 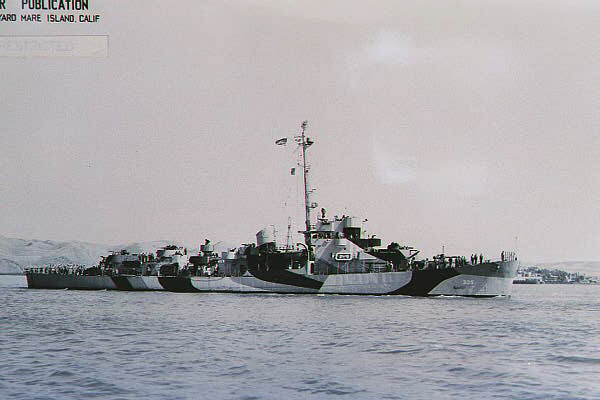 He was assigned temporary duty at Naval Air Station, San Pedro, Calif., and later to USS Arizona on 30 June 1941. Ens. 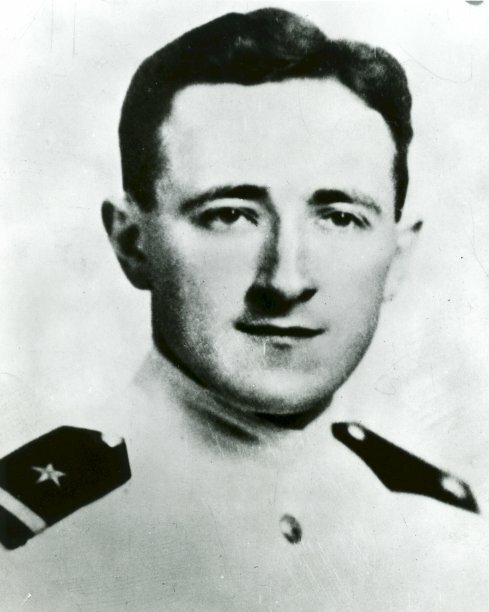 Halloran was among those lost in Arizona at Pearl Harbor 07 December 1941 during the attack by the Japanese Navy. He was posthumously awarded the Pearl Heart by General Order #186 on 21 January 1943. 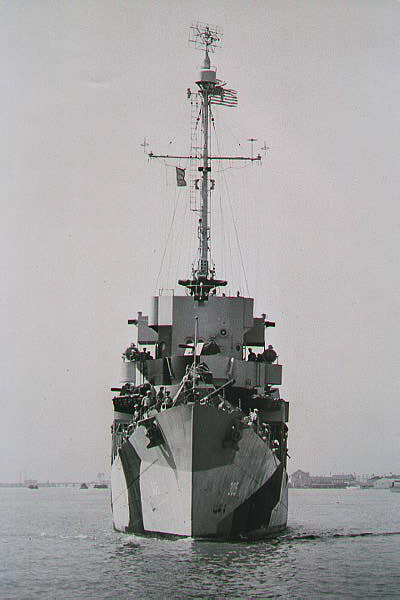 Other awards forwarded were the American Defense Service Medal with Fleet Clasp and the World War II Victory Medal on 22 November 1946. The Ohio State University named the Halloran House Dormitory in his memory. 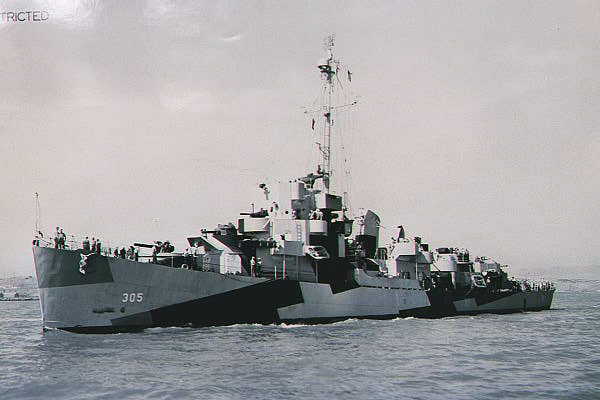 USS Halloran (DE 305) (1944-1945) was the first ship to be named in his honor. 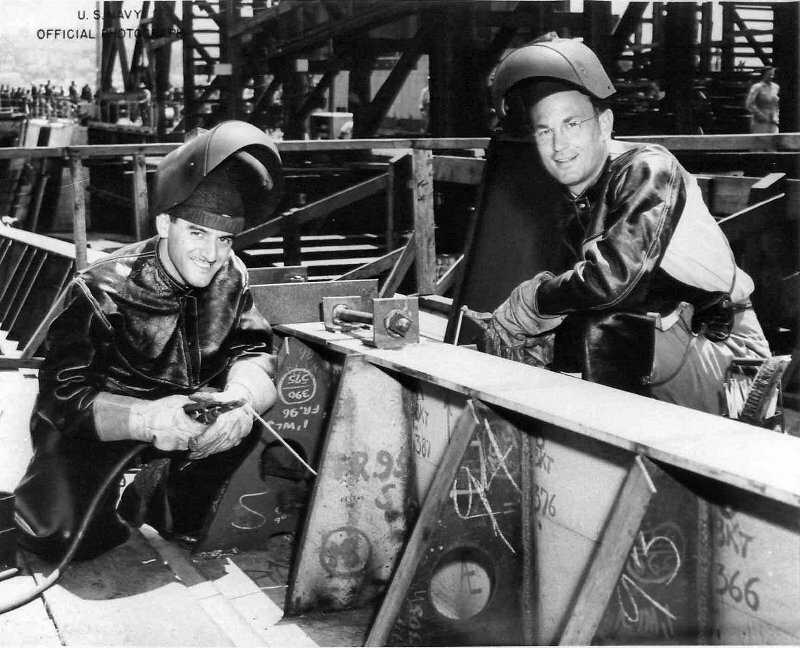 127k 21 June 1943: John R. Saroyan (Paint Lab) and Ross E. Morris (Industrial Lab) were the honorary keel layers for USS Halloran at Mare Island. 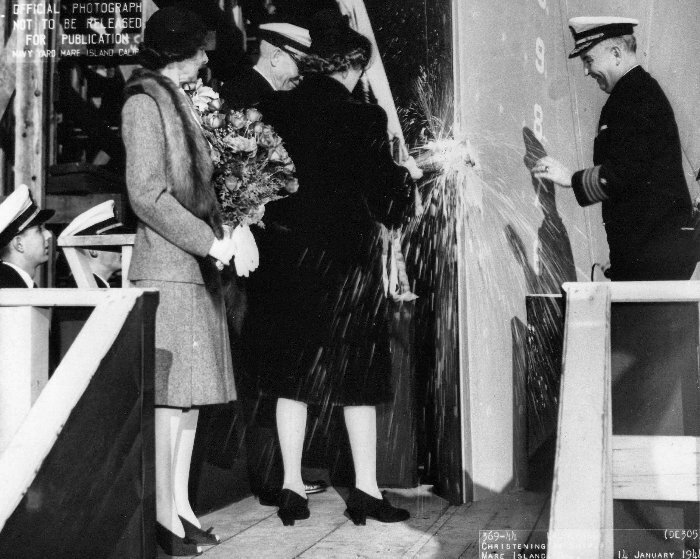 96k 14 January 1944: Mrs. L. J. Halloran (Sponsor) christens the USS Halloran (DE 305) at Mare Island. Left to right: Mrs. W. L. Friedell (Matron of Honor), Radm W. L. Friedell (Shipyard Commandant), Mrs. L. J. Halloran (Sponsor) and Capt. F. W. Scanland. 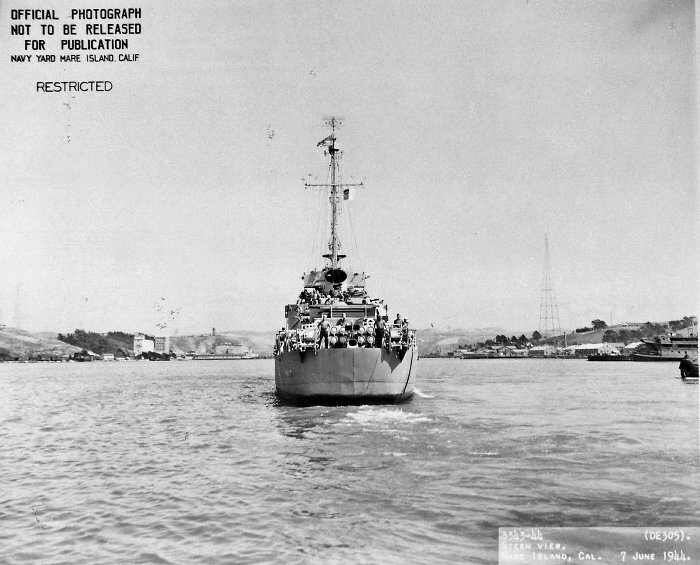 80k 21 June 1944: Stern view of Halloran departing Mare Island. 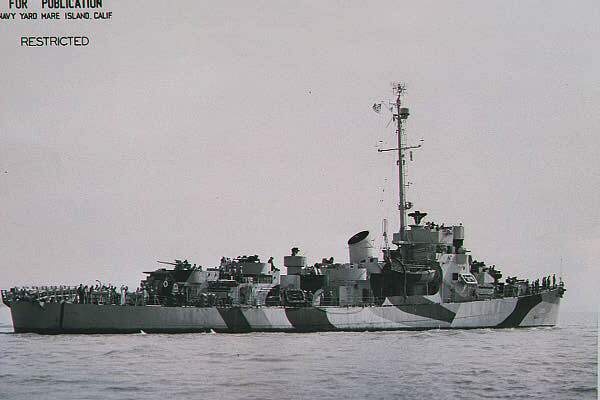 134k late 1945: Photo taken from the troop ship General W. H. Gordon (AP 117), showing Halloran alongside. 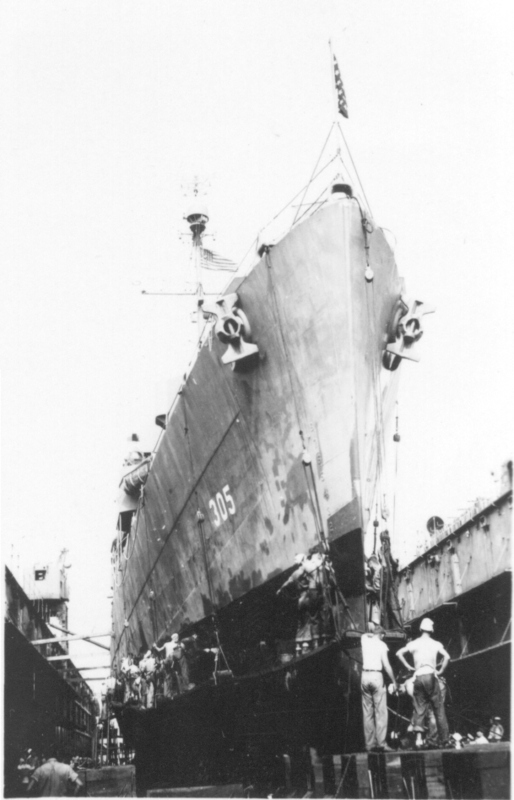 View the USS Halloran (DE 305) DANFS history entry located on the Naval History and Heritage Command web site. View a short article on the design and development of the Evarts Class DE submitted by Bob Sables. 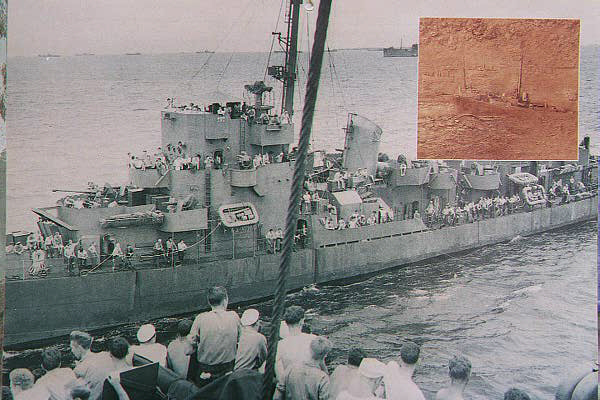 View the official War History of USS Halloran as submitted by the ship at war's end.